It’s been a while since I’ve done a garden post. 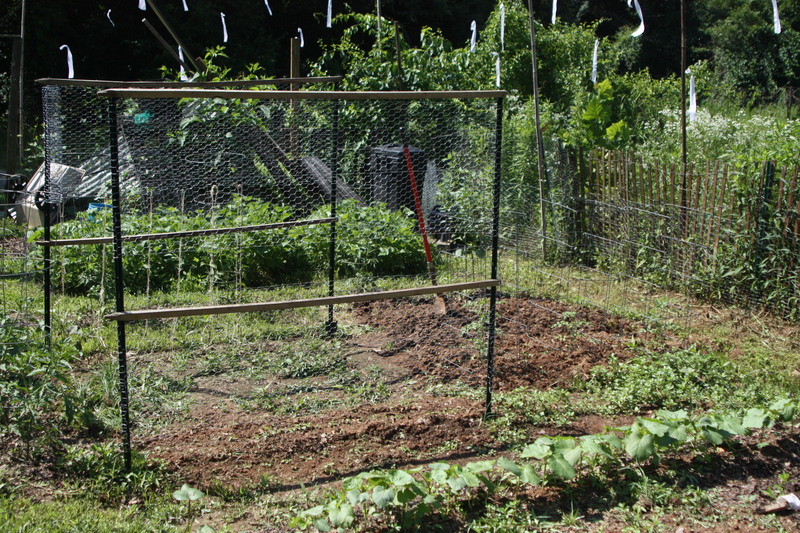 I’ve mentioned I’ve expanded to a second vegetable patch off site – in the nearby community gardens located behind the English Inn – but I haven’t shared anything from that site with you all yet, have I? Well, let’s fix that. I share this spot with my friend Virginia, who has done much of the work down there. 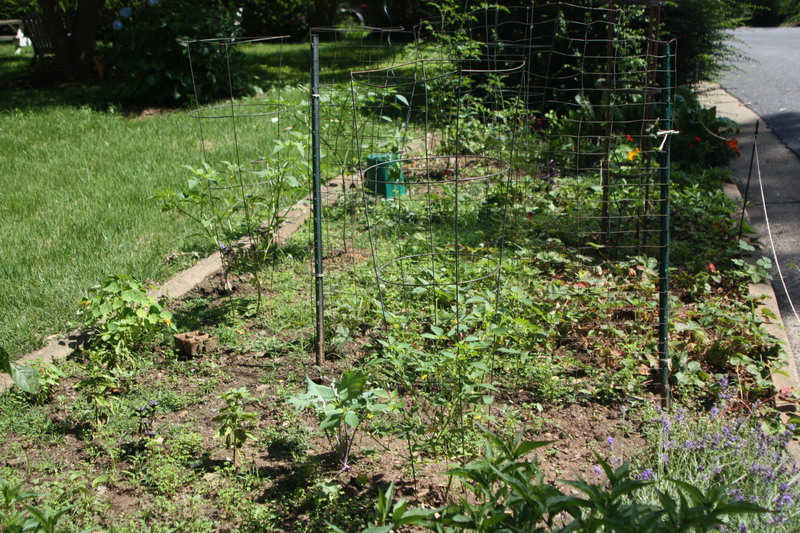 I’ve stuck some tomatoes & peppers in, attempted to weed around the perimeter and the blackberry bush and ended up with nasty cases of poison ivy every time. It’s quite something in the breeze. Virginia did most of the work on that particular project as well as building these awesome structures for things like beans and cucumbers. Which hopefully will be covered with Malabar Spinach here shortly. 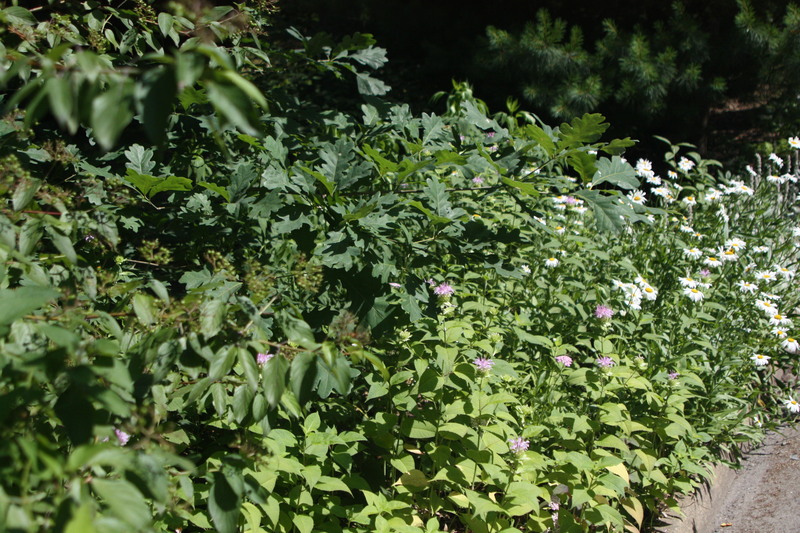 One thing both gardens have in common is an abundance of weeds. I may actually be growing far more weeds than anything else. I’m not sure I’ve ever had such a problem with weeds before – is it something I’m just blocking out or is this year worse? Anyone? The marigolds are volunteers, no doubt having sprung from some deadheads I left scattered about last year’s garden. Spring was such a weird growing season – late to start with, then quite chilly for the longest time. The first batch of arugula I planted bolted before it was big enough to harvest. So frustrating. 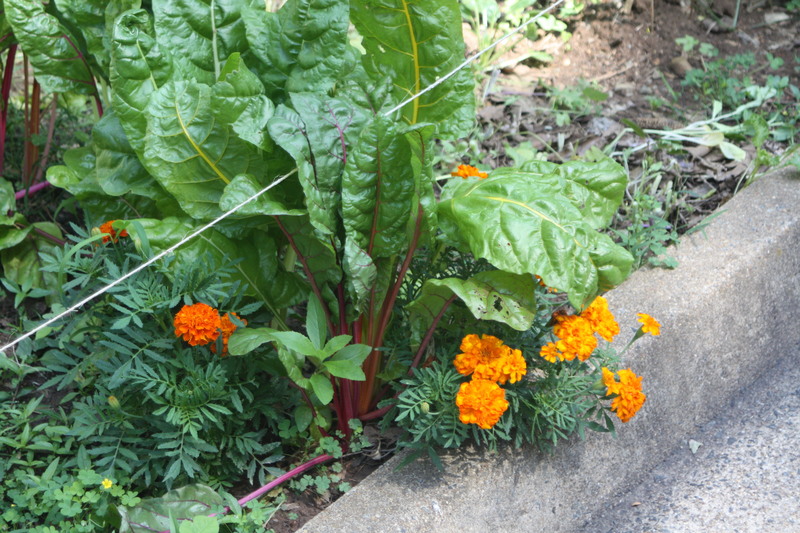 The second batch I planted did far better, as did a long row of ‘braising greens’ I planted that according to the package was a blend of kales, bok choys, collards, chard and more. I didn’t thin it, then harvested it all probably a little too late. Yesterday I chopped back the last of the arugula and what was left of the row of my braising greens. I filled a gallon bag with kale and a 2.5 gallon bag with the remaining braising greens. Greens, it’s what’s for dinner this week. 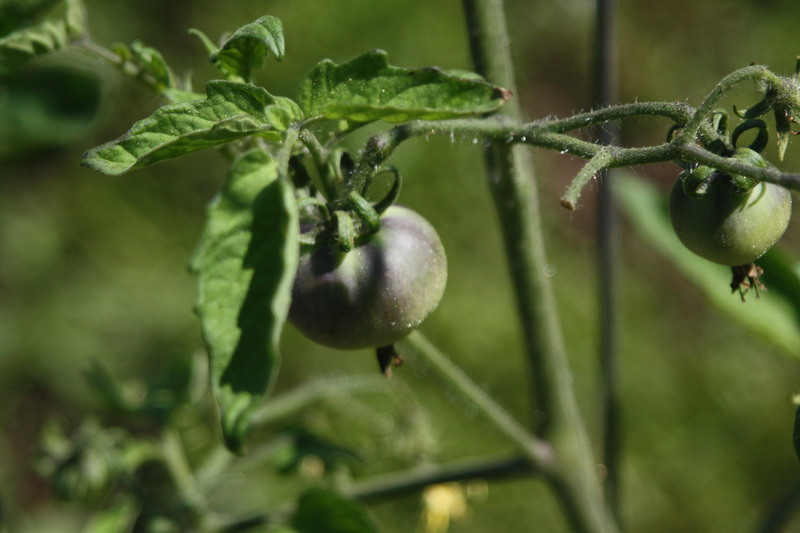 I have my first purple tomatoes coming in down at my auxiliary garden as we’re calling it. That is an Indigo Apple plant I got from my friend Cynthia. She starts all sorts of heirlooms and then sells them, mostly at the Crozet Farmer’s market. Far too many of the heirloom peppers I got from her died in the great flood of our plot in May, but such is the gardening life. 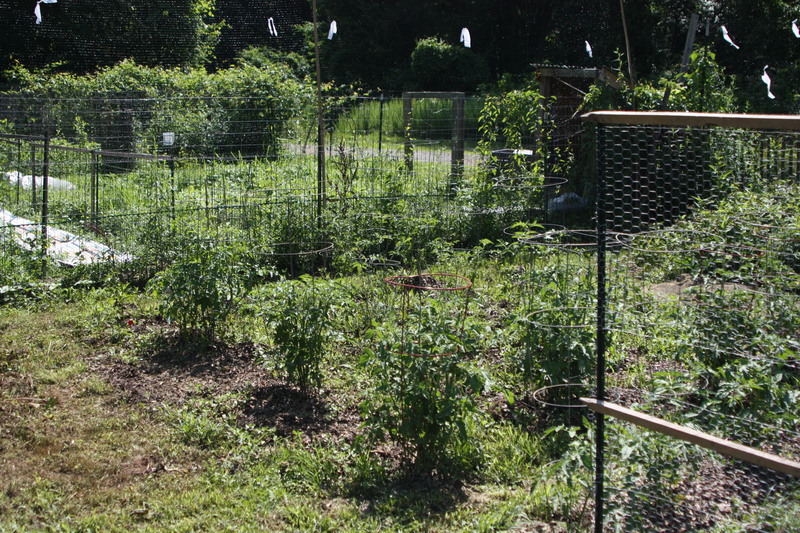 I was worried having an offsite garden in addition to the one here at the homestead was going to be too much for me, but I’ve long wanted more space that got full sun. The thing about it is that it’s not just outside my door. I can’t spend a quick five minutes weeding here and there. I have to know what I’m doing when I go down there so I’m prepared, as everything must be schlepped down there – tools and water. The spot is close enough to walk with most of the walk there being down hill, but it’s just a smidge too far to want to carry a bunch of tools with me. We have to carry our garbage out as well, so having the truck is quite handy. It’s fun having a project to do with Virginia. It’s been awhile since we hung out at the park every day with our kids and it’s a good excuse to do stuff with her. We have grand plans of happy hour down there. Yesterday as we were pulling weeds and thinning her beet patch I sort of kicked myself I had taken off without my wallet, as a cold beer would have been most excellent. Next time. 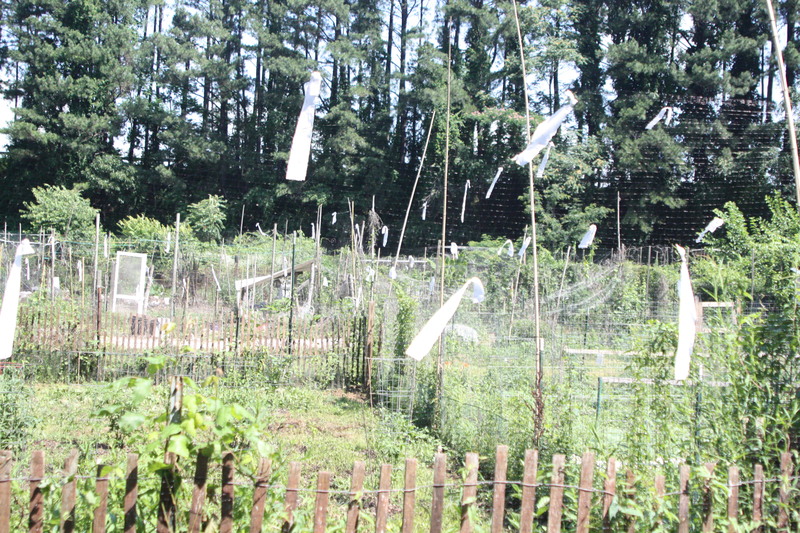 Meanwhile, back at the homestead garden, the strawberries seem to have finally exhausted themselves. While I’m sad to see them go, I was starting to get tired of picking strawberries, not to mention the whole finding new ways to use them. The weather which did everything else in my garden no favors, was quite conducive to a rather long and productive strawberry season. I swear, I picked strawberries every day for over a month. I put up all those jars of jam, we ate them for breakfast & dessert daily, I froze some, gave some away and even managed to put up a jar of pickled green ones. We’ve now segued into blueberry season. Our early bush is loaded down – I’ve already picked a rather large basketful that we walked by grabbing handfuls at a time to eat until I realized we were barely making a dent in the pile. Blueberries are, of all the foods I put up, hands down the easiest to deal with. They require no peeling, no pitting, no hulling, no deseeding. When freezing them, it’s best to just pop them in the freezer, no washing required, as it can damage them. For real. Dealing with blueberries is just a treat. The monster rainstorms we had in May have resulted in monster blueberries this year. They are also quite juicy – per Edie’s request, I made blueberry syrup with the first round I picked. Blueberries are high in pectin -which is what makes jam thicken. She asked if I could make the syrup thinner this year, as last years was rather jam like upon January’s opening. I added an extra quarter cup of water to the recipe – which was doubled, so it was an eighth of a cup extra per batch this year – and yielded an extra 3 half pint jars than I did last year. That’s how juicy those berries are. This pot was a complete and total surprise one fine morning recently. 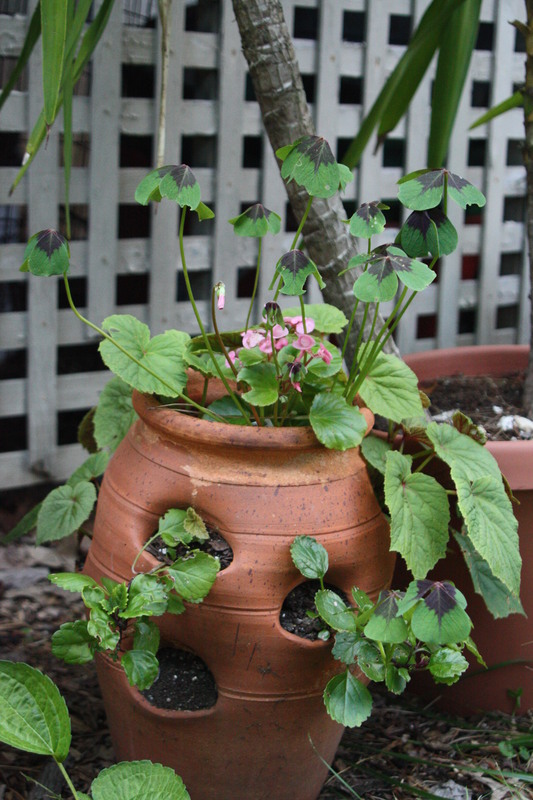 I had an extra begonia or two leftover from the hanging baskets on the front porch – I adore begonias, they are always blooming no matter what it seems – which I stuck in this empty strawberry planter. I had some cuttings from a money plant that needed a home, so I stuck them in too. Lazy gardener that I am, I left the dirt in from last year’s attempt to plant another variety of begonias as well as an iron cross oxalis I obtained at a swap. Neither one of those had done much last summer and I thought I had killed them. C’est la vie. Imagine my surprise when I walked past that pot one day to see these sprouts of life! All these plants I thought I had killed had in fact, gone dormant at the first sign of a chill last fall, only to spring alive come the first of June. It’s my surprise planter and I adore it. The bee balm is starting to open up and the daisies are in full regalia. I’ve done some thinning and rearranging of this bed down by the side of the road, but I need to do some more. That though, is an entirely different post. You have a beautiful garden, weeds and all! I’m so jealous… Someday I’m going to be able to do that! Lots of pretty and yummy stuff going on your way. Your bee balm didn’t make it? Now that’s curious! That stuff is hard to kill! Mine is back gangbusters. My butterfly bush however, is dead. It didn’t make it through the winter. I don’t see a lot of weeds. Rather, both gardens look beautiful. And I can almost taste those huge blueberries! Weeds are green and some of them are flowering, which is pretty! 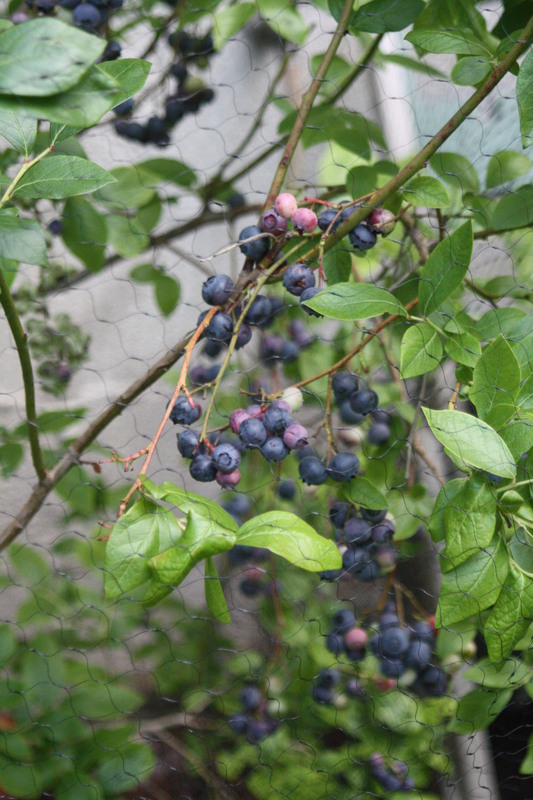 I have not had much luck with blueberries –I planted two plants in a nice sunny spot a few years ago. They are both the same size they were when I planted them, and this year their leaves are all yellow, and no blossoms. I’m going to just take them out eventually, but I’m disappointed –it’s one of my favorite fruits. I love that surprise planter –I’ve always wanted one of them! 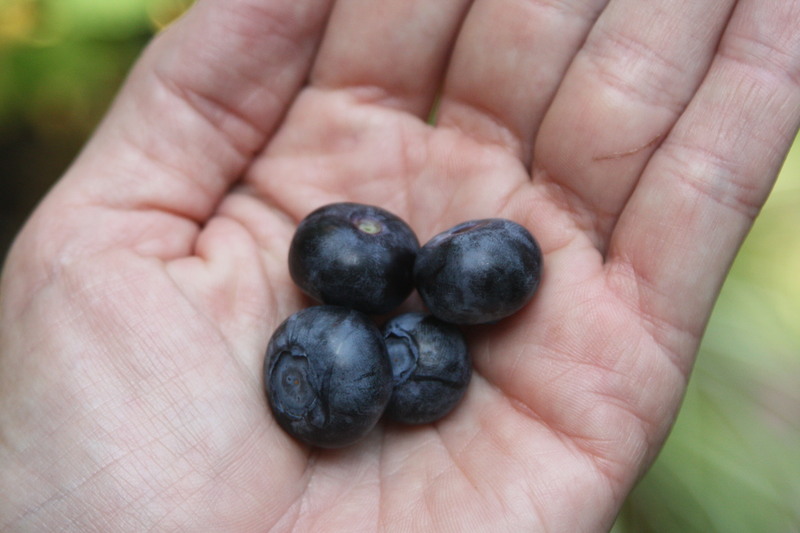 Your blueberries might need more water and a different soil composition than what they have. They need a little bit of effort when you plant them, but then they sort of take off. Visiting via Suzicate’s place. You have obviously been busy. Our strawberries did not like the strange and long winter, but the blueberries have been doing ok. We hope to do a bigger garden once the kids get older.